I had high expectations and the My Ireland Heritage team exceeded them. I had the pleasure to work with the My Ireland Heritage team in identifying our family’s ancestral townland in County Leitrim. In advance of arriving in Ireland, I communicated via email with Sean and Aisling providing them with the limited information I had. They researched the Irish records and identified records regarding my two times great grandparents. Once we arrived in Dublin, Sean called me prior to our trip to visit the townland. He suggested first visiting St. Columba’s house in Kells, where the Book of Kells resided for a time, and then visited the nearby workhouse in Bawnboy. What a suggestion that was. We first visited St. Columba’s house and then visited a nearby famine graveyard. Then onto the Bawnboy Workhouse. It is largely intact but in need of restoration. The Bawnboy Workhouse was impressively poignant as it drove home the reality of our ancestors in the mid-nineteenth century. 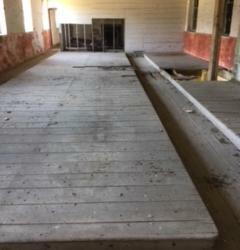 An amazing and unexpected walk through the workhouse followed which I will never forget. We then visited my ancestor’s family church in Drumeela, Leitrim. To pray for them in the exact church 150 years later was another memory for the ages. Sean then took us to meet with some locals with whom we discussed the families in the townland. Very helpful. Although we have no relatives living in that townland, the locals helped identify where some descendants moved. Sean then took us to several ancestral home sites. 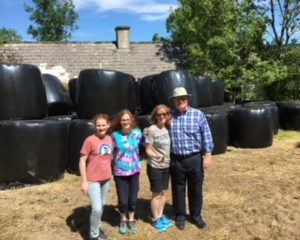 Climbing over wrapped cattle fodder bales, we entered and explored one of the old home sites. Just an incredible experience and supported by records which were provided to me in a hard copy book. 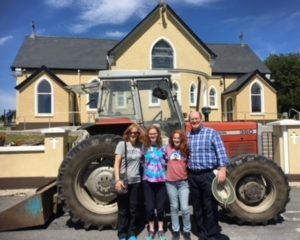 One final point, in an early email I noted that a significant reason for the trip was to connect our two teenage daughters to their Irish heritage. Sean took that to heart and went out of his way to explain everything to our daughters who ate it up. I heartily endorse Sean, Ian and Aisling as we had just a fantastic experience. Visiting your correct church and Graveyard is paramount we take pride in finding this substantiated with “Facts” which you will see. To Find the Original House which we excel in and to know you were there is beyond a Dream. To build your customised Tour with Irelands History such as the Bawnboy famine House is our Pleasure after all this is you’re Past, Our Findings and your Journey.